Powers/Abilities: Rose is a highly skilled spy and an excellent fighter, equally skilled in hand-to-hand combat and in the use of handguns, crossbows, machine guns, and knives. She is also an accomplished computer hacker. (Punisher II#7/Punisher: Empty Quarter ( fb) - BTS) - Rose Kugel was born in a Palestinian refugee camp, although she is also an Israeli citizen. Her parents allegedly died in a terrorist bombing incident in Israel when she was 16 years old, and she has implied that it was this tragedy that motivated her to enter the espionage field in order to work against terrorist movements. The circumstances under which she joined the Mossad are unrevealed. (Punisher II#7 (fb) - BTS)- In the course of a mission against the terrorist Revolutionary Jihad, Rose tracked one terrorist, Yasir, to an encounter with the Punisher; she then invaded the Punisher's base by drilling a hole from the sewer into his basement. (Punisher II#7) - Rose introduced herself to the Punisher and offered to work with him against the Jihad. They learned from an informant that the Jihad planned to use a plutonium bomb against Gallagher Plaza and a nearby theater. They arrived at the plaza, where Rose killed one of the guards. The Punisher took down his earlier target Yasir, but Rose was captured by another terrorist, Ahmad, atop a construction crane. When Ahmad took aim at the Punisher, Rose shot at the terrorist, who retaliated by throwing her from the crane. The Punisher then killed Ahmad. �(Punisher II#48 ( fb) - BTS/Punisher II#7 (BTS)) - Unknown to the Punisher, Rose's fall was broken by a pile of sand, leaving her bruised, but alive. She departed the scene, allowing him to believe her dead. 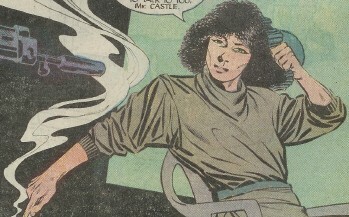 The Punisher's subsequent investigation revealed that Rose had invaded the National Crime Council to plant her credentials; the Mossad denied any involvement with her, and there was no record of her Israeli citizenship. (Punisher II#48 (fb) - BTS) - When the Punisher killed a Mossad agent in pursuit of ammunitions scientist Dr. Morris Brattle, Rose went undercover in the Middle Eastern nation of Trafia, to which Brattle had sold a specialized form of heavy weaponry, the Brattle Gun, which the Mossad feared might be used against Israel; she cooperated in this endeavor with the freelance operative Saracen (an enemy of the Punisher), who was at the time acting as a double agent for the interests of Trafia's neighbor Zukistan while holding the title of Trafia's head of security. Posing as a scullery maid, Rose received secrets from a second spy, Pasha Shakbander, and intended to sabotage Trafia's gun. However, both she and Shakbander were discovered and imprisoned. (Punisher II#47) - Colonel Razir and the visiting Brattle observed Rose and Shakbander in prison, shortly before learning that the Punisher had entered Trafia in an effort to investigate the activities of Razir and Saracen. (Punisher II#48) - When the Punisher's ally Microchip led Zukistani forces in an invasion to seize the gun, Rose escaped and encountered the Punisher. Although the Punisher intended to kill Saracen, Rose informed him that Saracen was serving Zukistani interests and that her target was actually Brattle. When the Punisher and Saracen confronted each other in battle, Rose departed the scene and later held Colonel Razir at gunpoint, presumably killing him shortly thereafter. The Punisher killed Brattle some time later. (Punisher: Empty Quarter ( fb) - BTS) After Israeli intelligence learned of an abandoned arsenal in the Saudi Arabian desert, to be used as a site for the First World International Terrorist Convention, Rose was sent undercover to infiltrate the defenses of the Convention's organizer, a terrorist called the Jackal. �Acting as a courtesan, Rose awaited the arrival of a second agent who was using the cover identity of Rolf Ganzi of the Serbian Nationalist Movement; however, " Ganzi" died when thrown from his camel en route to the Convention. (Punisher: Empty Quarter) - Disguised as his enemy Saracen, the Punisher attended the Convention and ingratiated himself with the Jackal. The Jackal offered him the "hospitality" of either a courtesan (Rose), a young boy, or a goat; the Punisher chose the first, and when they were alone, Rose revealed her identity to him. After (apparently) a brief romantic interlude, the pair worked together to disable their guard and set a bomb at the arsenal, fleeing from the explosion on rocket packs. However, they were confronted by the recently arrived Saracen, who briefly held Rose at swordpoint, then engaged the Punisher in battle while Rose fled to find transportation. After the Punisher killed Saracen, Rose returned with a jeep, and the two drove off together, intending to join a Humans Off Planet caravan to Qatar and whiling away the time with idle talk of a future together. As far as is known, the two have not met since. Comments: Created by Mike Baron, Davis Ross, and John Beatty.